This band just entered my radar. From Fredericton (New Brunswick) comes the 5-piece band The Slate Pacific. Centered around principal songwriter Logan Hawkes, we’ve got something here that hits a nice balance between moody folk and noisey indie rock. They’ve been doing some dates in the East Coast with Dog Day, Hey Rosetta! 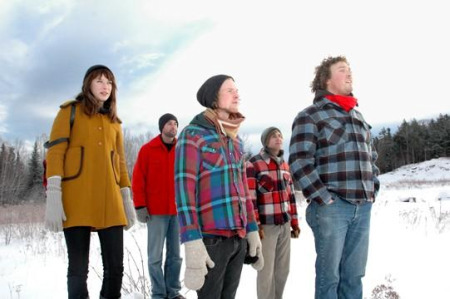 and Wintersleep in the past, more dates in March (myspace). Their debut EP (Safe Passage) will be out at the end of that month on Forward Music. Here’s a taste, Jenn’s Not Going To Make It. These songs actually reminded me of a band called Beautiful Senseless. At the office we used to throw their discs in the player all the time. Don’t think they’re around anymore.